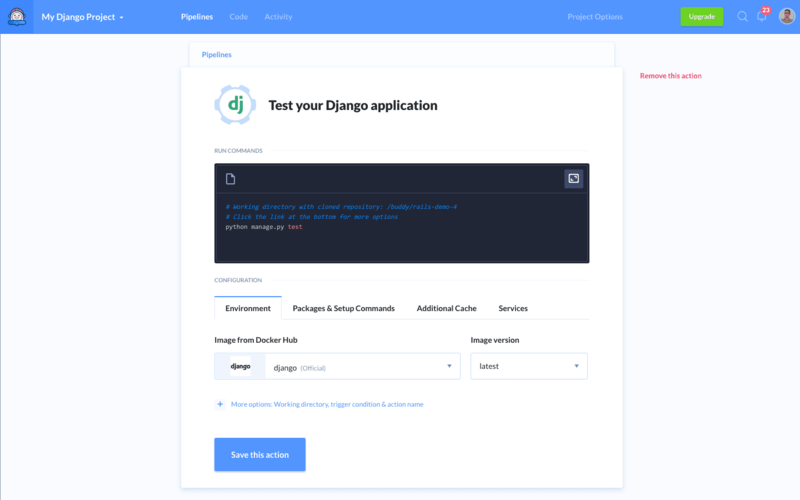 Django is a popular Python framework which “makes it easier to build better Web apps more quickly and with less code” and was created to simplify the process of delivering complex, data-driven websites. According to its designers, Django makes meeting deadlines easier by encouraging rapid-development with clean and pragmatic design. The framework also takes special steps towards security (eg. SQL injection and cross-site scripting), and is exceedingly scalable and versatile. Add and configure the Django action. You can install dependencies in the Packages tab. TIP: If you’d like to learn more about delivery automaton (eg. Dockerizing applications), check out our guides section.